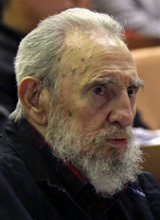 Retired Cuban leader Fidel Castro has urged North Korea to show restraint amid escalating tensions on the Korean Peninsula, AP reported Saturday. Pyongyang and Havana are two of the very few communist countries left and have been close allies for a long time. In a column in the Communist Party daily Granma on Friday, Castro said Korean are facing "one of the most grave risks of nuclear war" since the Cuban missile crisis in 1962. "It would not be fair to forget that such a war would affect… more than 70 percent of the planet's population," he added. He also warned the U.S., saying that if a war breaks out on the Korean Peninsula, the Obama administration "would be buried by a flood of images that would present him as the most sinister figure in U.S. history."